We could see them fighting from the end of the street. 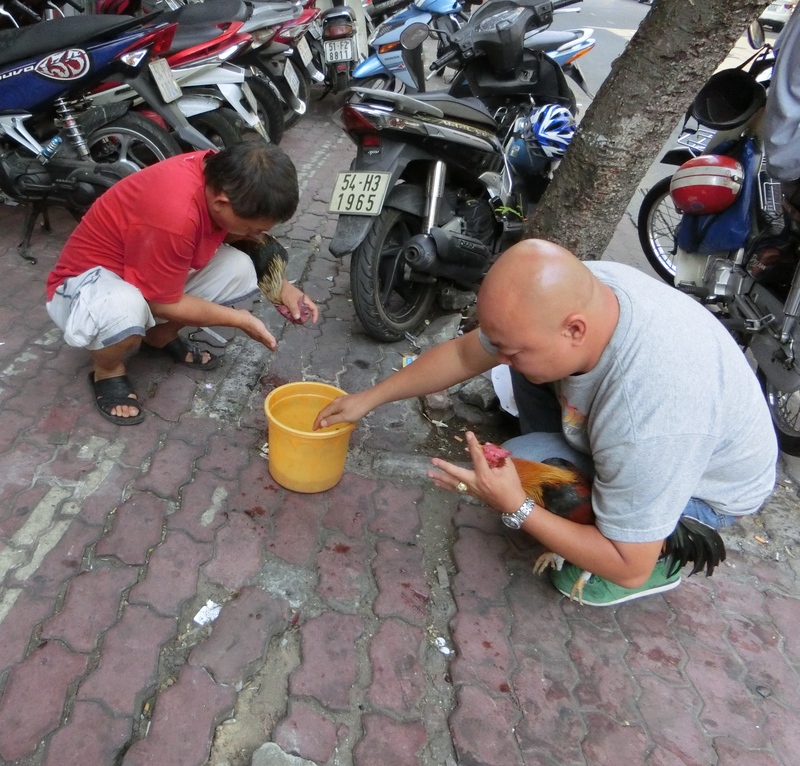 It was the middle of the day, and a gambling sport that is illegal and hidden in the U.S. was taking place in broad daylight on a busy street corner in Ho Chi Minh. The roosters were not fighting so much as sparring. The owners told us that they were in training. The roosters, after a few moments of fighting, walked around with their chests puffed. 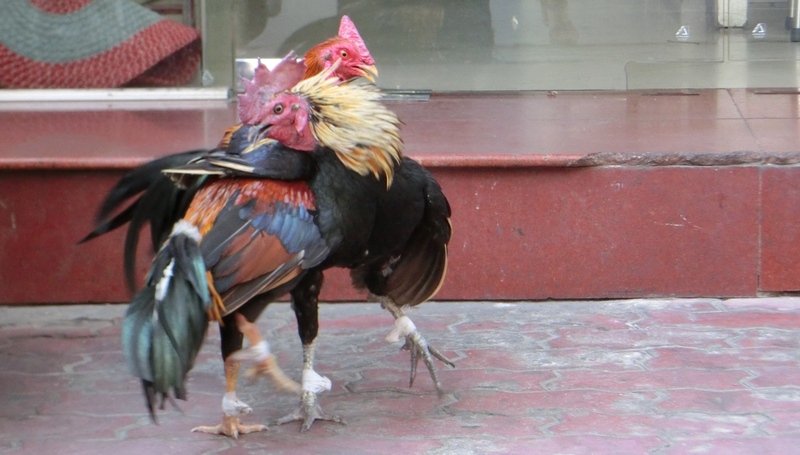 One rooster strutted with what I could only describe as a type of arrogance, a pride. He crowed loudly even though there was no winner in this fight. It was a friendly match. 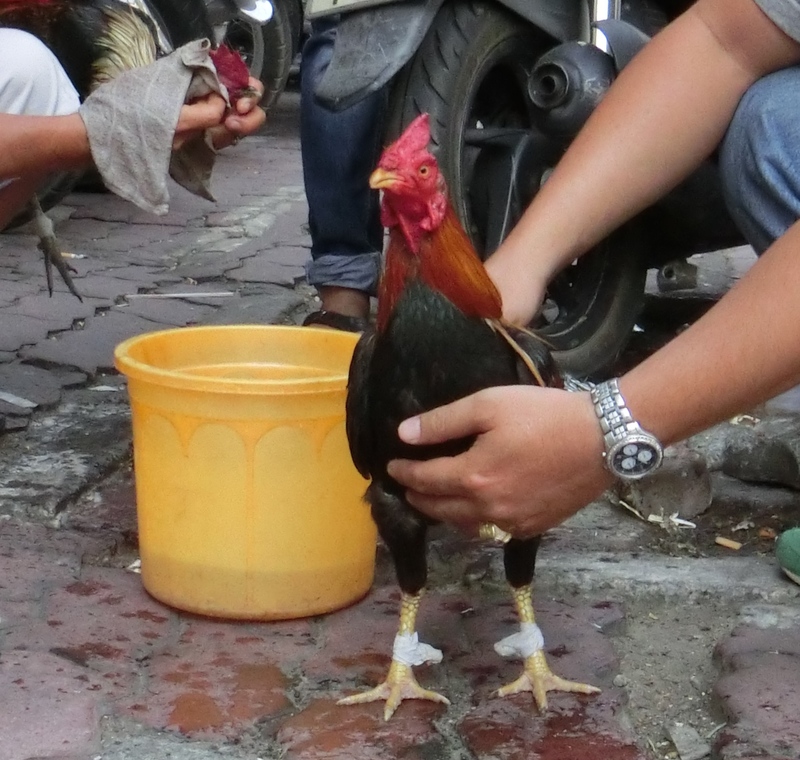 After the sparring match the men held their roosters and pried their beaks open with their fingers. They held the beaks open using their first and middle fingers while holding the birds in place between an arm and their leg. 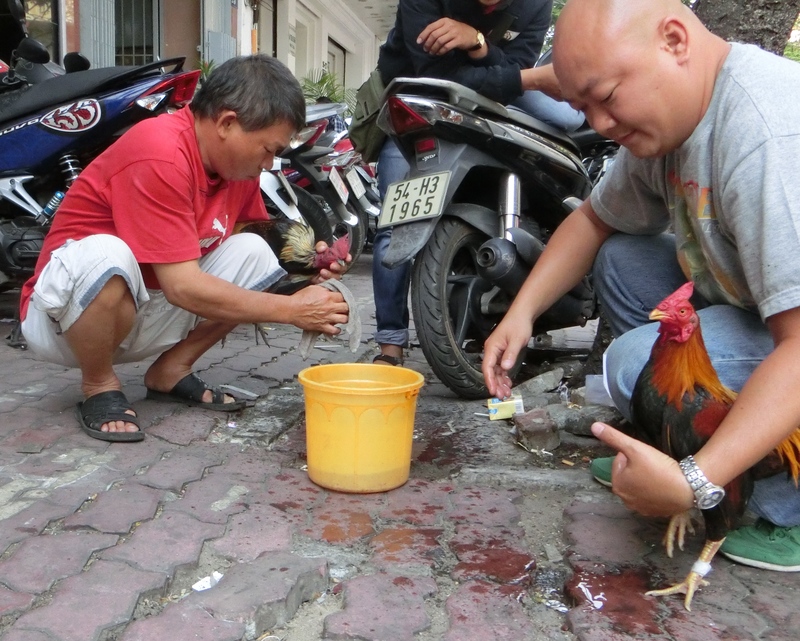 With a free hand they cupped water from the yellow bucket and dripped the water into the roosters’ beaks. The rooster were tipped downward as the men tapped at their necks. The birds made gurgling sounds similar to when children make an awwww sound as a friend drums on their back. Water and bits of feathers trickled onto the sidewalk. 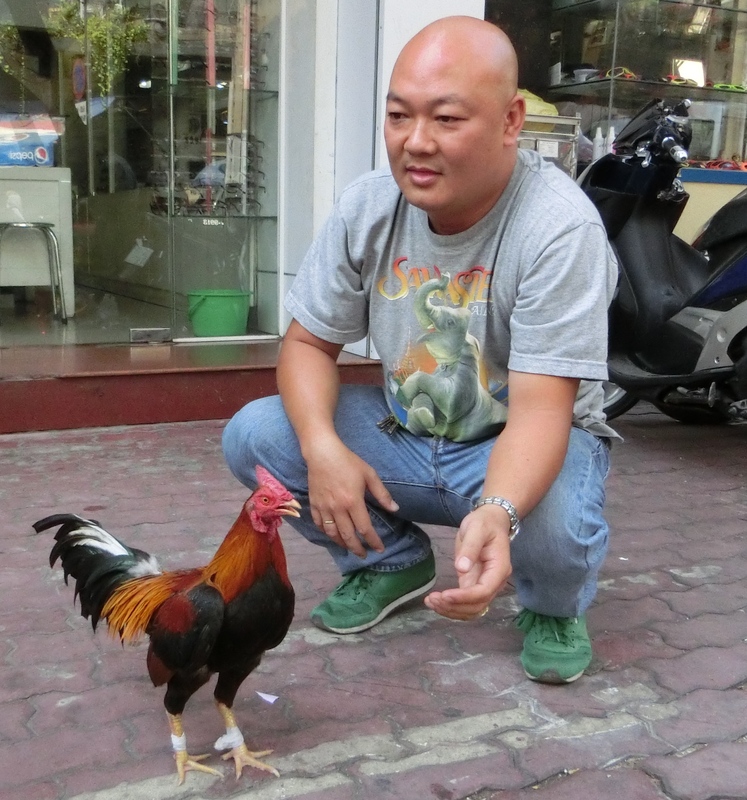 After the cleaning the rooster posed with his owner who held him with darling and confident pride. This entry was posted in Viet Nam and tagged color, color photo, Ho Chi Minh City, photo, photographs of animals, pictures, Saigon, travel, Travel Asia, Viet Nam, Vietnam. Bookmark the permalink. It’s actually illegal here in Vietnam too, just that the cops are easier to pay off when it comes to stuff like this here. Wow! I would never have guessed that. Thanks for letting me know. That information totally changes my impression of the images and the actual interaction with the men and the roosters. Based on their easy going nature, and all the people watching the rosters practice, my friend and I taking photos; I thought it was legal.